Mplan Media has exclusive partnership with top Airports in India, providing innovative ideas to advertise about your brand. 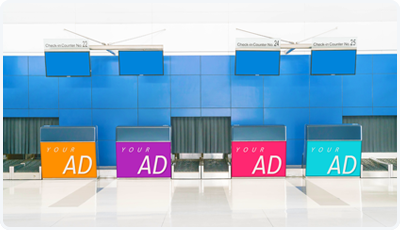 Mplan provides many unique ways of advertising in Airport such as Trolly advertising, Baggage counter advertising, Billboard advertising and much more. Indira Gandhi International Airport, New Delhi. Chhatrapati Shivaji International Airport, Mumbai. Chennai International Airport, Chennai. Cochin International Airport, Kochi. Kempegowda International Airport, Bangalore. Rajiv Gandhi International Airport, Hyderabad. Or Call us at 9916897609 to get a customised Airport advertising plan for your brand.